Financial analysis was the third element of my primary research on BP 2010 Deepwater Horizon Oil Spill Crisis. 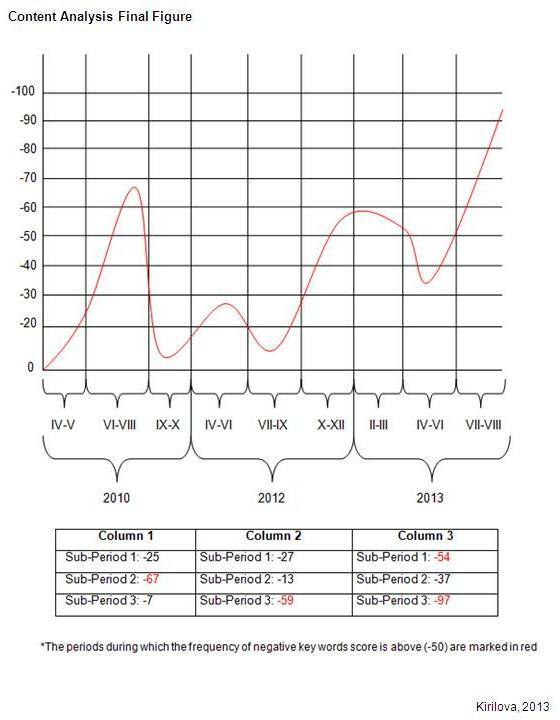 The financial analysis results are summarised according to the three periods throughout the crisis – Early Period (Victims Cluster) – April-October 2010, Shareholders/ Investors Period – April-December 2012 and Strategic Shift Period – February-August 2013. The figure below shows BP’s results on the New York Stock exchange (NYSE:BP) for the period between April 20, 2010 and October 29, 2010. During this period BP hit the bottom on June 25, 2010 with $27.02 per share. However, very quickly after this date (20 days later) the share price rose again, reaching $38.92 per share on July 15, 2010. It continued to grow until the beginning of August, scoring $41.33 on August 6, 2010. After that the share price fell slightly in the second half of the month. In September, however, it started to grow again reaching its highest price of $41.95 on October 1, 2010, still $19.53 less than on the night of the incident – $60.48. The reason for the slightly recovoring of the share price was BP’s decision to replace it’s British CEO Tony Hayward, who was a dead man walking, with the American Robert Dudley. The crisis communicator plays a crucial role as they are the face of the company during the crisis and the bond between the company and its external stakeholders; and it is the stakeholders’ trust in the company that allows it to continue as a business. That is why the appointment of an appropriate crisis communicator was crucial for the survival of BP. With this decision, the company made a step in the right direction and started to take control of the situation. During the Shareholders/ Investors period, BP shares remained high in the first month and a half and after that fell from $45.34 on April 2, 2012 to $36.46 on May 31, 2012; however this was still very far from the bottom the price hit in June 2010 with $27.02 per share. 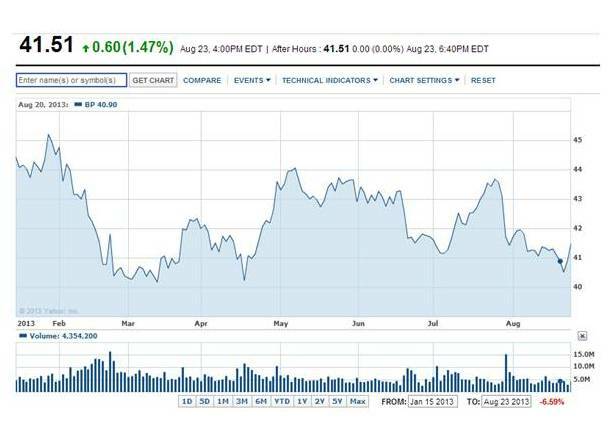 Between June 4, 2012 and November 16, 2012 the share price rose and fell in almost proportionally. These results do not show any indication that BP was fined by SEC for lying about the amount of oil spilled in the Gulf of Mexico. 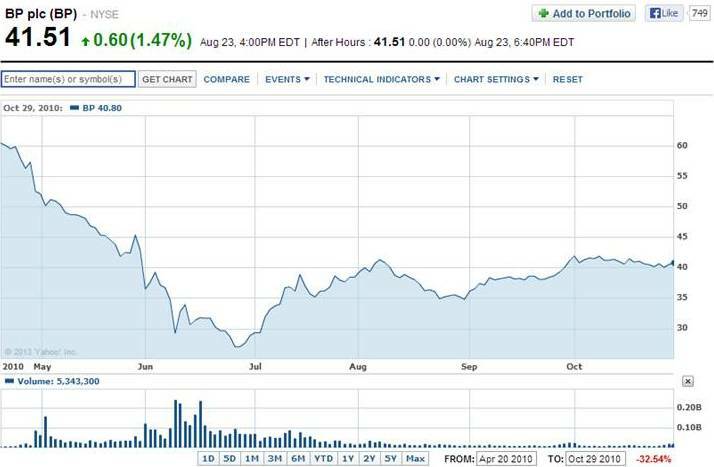 After November 15, 2012 when the company signed a settlement with the Department of Justice, the share price rose. These results show media coverage doesn’t affect the share price significantly. Therefore, investors and shareholders are not directly influenced by the position of this stakeholder group. In the last period of the crisis, the share price went through more drastic movements than the share price since the previous period, but it still remained stable. 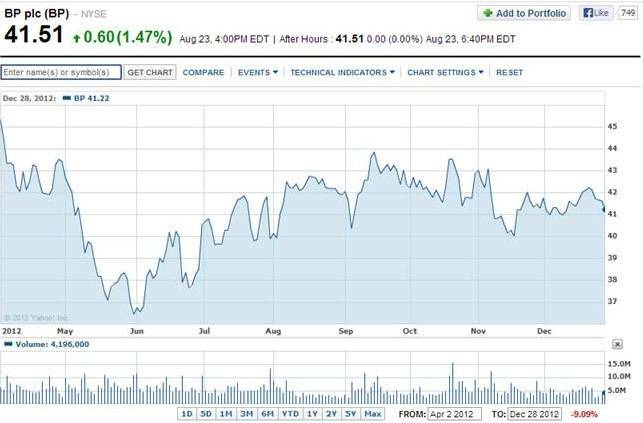 Since January 29, 2013 ($45.21) the share price was falling continuously to $40.19 on March 13, 2013. After that period it fell and rose again until April 17, 2013 when again fell to $40.23. Between May and July, 2013 the share price remained stable staying around $44. After July 25, however, it started to fall again and on August 21, hit $40.53 per share. The reason was BP’s decision to sign a compensations settlement agreement with The American Federal Government and Department of Justice, opening itself to uncontrollable payments. This broke the trust of its stakeholders who started suing and abandoning the company. The results of the financial analysis proved the share price was not influenced by the media coverage. The figure below compares the media coverage score with BP’s share price performance throughout the three periods of the crisis. An interesting fact to be noted is that the share price was following the media coverage score only in the first five months of the disaster. After that the two lines went in completely different directions. This proves investors and shareholders are not influenced by the media; so BP should have communicated with its investors and shareholders directly, instead of using the media as an intermediary. It might have been used as an intermediary when the victims were definitive stakeholders as it the results showed the media was a bigger influencer for them. This is the second of two posts, revealing the results of the second primary research method I used in my BP 2010 crisis case study- specialist interviews. As mentioned in the first post, for this research, four interviews with four different specialists were conducted – Crisis Communication Specialist, Maritime Law Specialist, Reputation Repair Specialist and Oil Industry Specialist. Previous post revealed the results of the Crisis Communication Specialist and Reputation Repair Specialist’s interviews. Today’s post will show the main findings made out of the Maritime Law Specialist and Oil Industry Specialist’s interviews. The MLS interview gave a new perspective to the research as it was given from a legal point of view. Unlike the other specialists who discussed and analysed BP in terms of its crisis response and reputation repair strategies, the maritime law specialist analysed it from a legal point of view which helped to understand some of the company’s decisions taken throughout the crisis as well as to predict what might be the possible consequences out of them. BP was not the only one which was involved in the Deepwater Horizon disaster, there are many other companies such as Halliburton, Transocean, Anadarko Petroleum, Moex, Cameron International etc. which either held shares in the Macondo project or supplied the materials for it. However, BP was the one that was attributed the biggest responsibility and was involved in the whole compensation payment system without much/ any help from the other companies. Why was that? According to the maritime law specialist, the official statement was that after the accident BP officially accepted the responsibility for the whole crisis; BP made agreements with Transocean and Halliburton, protecting them from pollution claims (this might have happened as a result of panic straight after the crisis). According to these agreements BP took over the entire burden for the spill. Moreover there was a study conducted by 25 experts who all said the fault was BP’s for not following the advice given and the safety requirements. Also, no matter other companies were involved and it might have been their fault not providing highest quality materials or equipment, it was still the operator who had to ensure that the rig was operating under the highest quality standards. However, the MLS gave another “unofficial” explanation to the above statement, which in their words was “marketing gossip”. According to it, BP was the strongest non-US party involved in the whole issue (the other companies are mostly American), so this was the reason why it was prosecuted so vigorously by the USA (underline politics of a country). It was a good thing for it to point at a company which was non-US one because this way the American companies came out clean. That is why BP was the one appearing mostly in the news and was actually framed by the media. The maritime law specialist was not aware of the fact that BP was fined by SEC in the autumn of 2012, for lying to its investors and shareholders. However, a very important point the interviewee added to that issue was it could be used against BP in court. Moreover, the investors and shareholders might claim additional amount of money on top of this fine. In terms of simple and gross negligence, the MLS explained the main difference was that in case of ordinary negligence one does something with the strong belief that nothing bad would happen, whereas in terms of gross negligence one does something with the hope that nothing would go wrong. The interviewee also expressed their personal view that it was hard to determine whether BP was simply of grossly negligent, whereas in their opinion Halliburton was definitely grossly negligent as it was not operating under the required quality and therefore it acted with the hope that nothing would go wrong. At the question whether going to court was the right decision for BP, the MLS shared the other interviewees’ opinion that this was the only logical step the company could have taken as part of its strategy. The oil industry specialist expressed an opinion that compensation and apology were the best strategies BP could have used because of the global nature of the company. Any other strategy would have had negative effect in long term for both BP and its shareholders and investors. On the question why the overall responsibility was attributed to BP, the interviewee said the other companies were sub-contractors and worked on behalf of BP. Moreover, unless someone is following the incident closely, they would not be aware of the other companies participating in the crisis and the majority was pointing the finger at BP due to the negative media coverage. In therms of the fine by SEC, the oil industry specialist said BP went against one of the fundamental principles of crisis communication which is not to lie. When someone lies especially about something so big they will be found out at some point and this will aggravate the situation. The OIS also added that by signing the settlement with the Federal Government and the department of Justice, BP was hoping to limit its liability; however, it did not happen this way due to the US policy in case of incidents like this. That is why some companies such as Shell do not operate there. On the question why the judge refused to halt the settlement programme due to the accusations of fraudulent claims, the oil industry specialist argued that “the judge was in favour of the little man and in favour of the national against the multi-national”. As a recommendation, the interviewee said that BP should have had better contractor control and better oversight of a risk that had the potential to have such an impact. The OIS also added that BP was good at reacting but wasn’t good at being proactive in terms of its risk control. The next post will show the results from the last primary research method- financial analysis. It will look at BP’s performance on the American market (NYSE:BP) throughout the crisis and will analyse the reasond for the ups and downs of its share price. Don’t miss it out! This post reveals the results of the second primary research method I used in my BP 2010 crisis case study- specialist interviews. Interviews are a qualitative method of research and the most appropriate one for the purposes of this study as they provide an expertise and add value gained from a source of information, different from the ones already used. For this research, four interviews with four different specialists were conducted – Crisis Communication Specialist, Maritime Law Specialist, Reputation Repair Specialist and Oil Industry Specialist. As this section is quite a long one I will separate it in two parts. The first part will reveal the results from the Crisis Communication Specialist (CCS) and the Reputation Repair Specialist (RRS) interviews. The second part which will be posted next week will reveal what findings have been made out of the Maritime Law Specialist (MLS) and the Oil Industry Specialist (OIS) interviews. The crisis communication specialist interview revealed major issues related to BP’s strategy in theoretical terms applying some of the main Situational Crisis Communication (SCCT) principles. It also shed light on BP’s relations with its shareholders and investors and explained the sudden shift of strategy in the beginning of 2013. Similar to the content analysis, the interviews were also separated in three main periods during the BP crisis – Early Period (Victims Cluster) – April-October 2010, Shareholders/ Investors Period – April-December 2012 and Strategic Shift Period – February-August 2013. In the early period of the crisis, BP chose to use two main strategies proposed by SCCT – compensation and apology. However, the question is whether these were the most appropriate strategies and could the company have used some additional ones in order to strengthen its crisis response campaign. According to the CC specialist, BP made the right choice by using compensation and apology in the early stages of its campaign as it had no other alternative. As a worldwide company which spilled a massive amount of oil it could not have done anything else but to apologise and try to compensate those who were affected; any other strategy apart from these two would have made the situation even worse. However, even though these were the best options for BP, they did not have the positive effect it was aiming at because as a wealthy company it was the main target and the whole responsibility was attributed to it. Moreover, BP was probably prepared for some sort of a crisis, but it definitely lacked an adequate preparation for a crisis of this scale. In the early phase of the crisis, BP hit the bottom on June 25, 2010 with $27.02 per share. However, it managed to recover quickly and six months later the share price rose by 40%. According to the CC specialist, one reason for that was the company’s decision to replace its British chief executive Tony Hayward with the American Robert Dudley. As the interviewee said, the ex-chief executive “was a dead man walking, saying the wrong things at the wrong time and his reputation was unrecoverable” so there was no way the company could continue with him. Moreover, the fact that the new chief executive was American was a courtesy to the USA and had its positive effects. The CC specialist was not aware that BP was fined by SEC in the autumn of 2012 but agreed that the fact BP lied to its investors and shareholders broke their trust. Moreover the interviewee expressed an opinion that this event has pushed the company into signing the settlement with the Department of Justice in November 2012. And the fact the settlement resulted in absurd claims and compensation payments was a breaking point in BP’s strategy when the company switched from defence to attack and started targeting its investors and shareholders as definitive stakeholders, putting them at “the heart of its strategy”. The RRS interview gave a new perspective to the research in terms of BP’s reputation repair strategy throughout the overall period of the crisis. Similar to the the opinion of the CC specialist, the reputation repair specialist also said that BP is perceived as a British company on the American market rather than as a global one. The interviewee also added that BP was attributed the overall responsibility because this is how it was portrayed in the media and also because it tried to distance itself from the other companies, which remained invisible straight after the explosion. Another important thing that was pointed out by the reputation repair specialist was that most of the other companies involved in the incident are American. Moreover, Halliburton is aligned to the previous presidential team (George Bush’s team), so they were perceived as a patriotic firm and nobody attacked them. One reason why the rest of the companies have not been harmed by the crisis and their shares even rose after it, according to the RRS was that BP lost its government contracts while the other companies did not. For instance Halliburton did US Federal Government contracts, Federal Defence contracts and so on. BP, on the other hand, did not have the Government support. Similar to the other interviewees, the RRS was not aware about the SEC fine. The reputation specialist expressed an opinion that some investors like the pension funds choose the companies they invest in because they are big not because they are ethical so BP lying about the true amount of oil spilled into the ocean should not have been such a big problem. In terms of the settlement BP probably did not look at the wording adequately. The next post which will be the second part of the interviews results, will give a legal perspective to the research and will look into the compensation agreement and the fraudulent claims that followed in more detail. This post reveals the results of one of the primary research methods I used in my BP 2010 crisis case study- content analysis. As BP’s crisis was widely discussed in the press, this was the best quantitative primary research method to be used. It gave a solid basis of quantitative information and proved some of my main points. If you want to get a general understanding of the entire study, check all posts in the “BP” and “Theories” sections of this rather academic part of my blog. There you will find information about the theories applied to the case study, the research methods and main findings as well as the proposal of new crisis communication models and theories. For the content analysis, 400 articles from different newspapers and different periods throughout the crisis were reviewed. The overall analysis was separated in three main clusters: 1) Victims Cluster (April 2010 – October 2010), which was reviewing articles from the Guardian and BBC News in the first six months after the crisis; 2) Shareholders Cluster (April 2012 – December 2012) reviewing articles from financial sources (Reuters, Bloomberg, The Telegraph, The Financial Times, BBC News and Wall Street Journal) in the second half of 2012 when a number of events of great importance happened, related to BP’s investors and shareholders; and 3) Strategic Shift Cluster (February 2013 – August 2013), which was reviewing articles from BBC News, The Guardian, Huffington Post, The Telegraph, New York Times, The Financial Times and Wall Street Journal in the period during BP trial, when the company changed its strategy from defence to attack. In order to be analysed in an easier way, the Victims Cluster was separated in three sub-periods – April-May, June-August and September-October. In the first sub-period, which was straight after the drilling rig platform blowout, the score was negative – (-27). The score for each period was determined by the frequency of key words that appear in the articles of that period. The score for each article was determined by the type of the article – neutral – 0, positive manor – (+1), positive major – (+2), negative manor – (-1) and negative major – (-2). During the second sub-period the frequency of negative key words increased to (-67). This was the period when BP share price had hit the bottom on the stock markets with $27.02 per share (BP: NYSE). During the third sub-period the company took control over the situation and made a very important step in the right direction by replacing its British chief executive Tony Hayward with the American Robert Dudley. This had positive effect on BP and the content analysis results proved it – the frequency of negative key words in the third sub-period reduced to (-7). 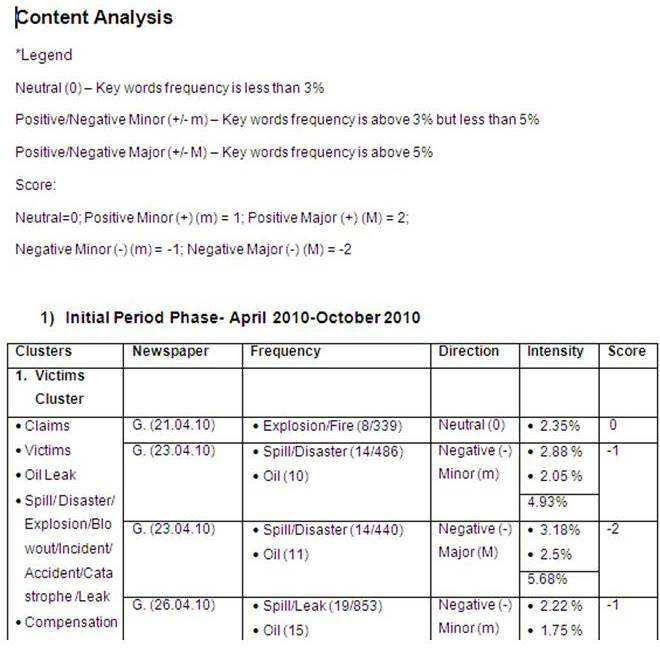 The most frequent key words that appeared in the articles from the Victims Cluster were: “oil spill/ leak”, “disaster/ incident/ accident”, “costs”, “compensations” and “share price fall”. 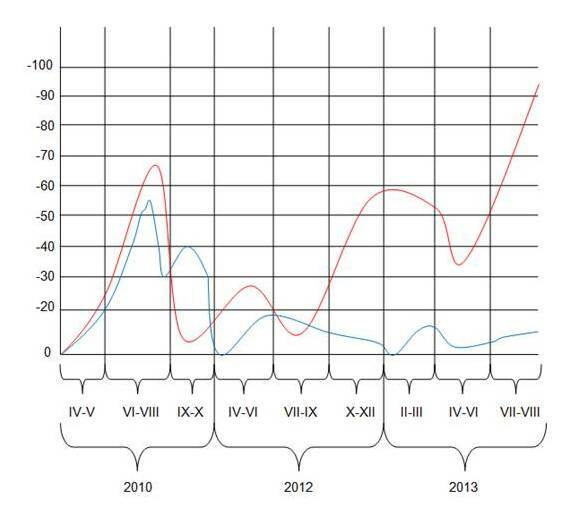 The Shareholders Cluster covered the period from April 2012 to December 2012. During this period key events that were of great significance for BP and directly related to their shareholders and investors happened. These events were also argued to be in the core of BP’s sudden shift of strategy and also shift of stakeholder salience groups. The Shareholder Cluster was also separated in three sub-periods – April-June, July-September and October-December. In the first sub-period the score was average, keeping at (-27). In the second sub-period it reduced by half to (-13). During these two periods BP’s shares fell and rose slightly but did not make any significant difference to the situation. Shareholders and investors also gave small indications for change of their position toward the crisis and the way BP dealt with it until then. For the first time the articles from these two sub-periods started to contain key words such as ‘’settlement’’ and “agreement”. During the third sub-period it could be observed from the graph that the frequency of negative key words rose significantly to (-59). This could be explained with two key events that happened in November 2012, directly affecting BP’s shareholders and investors. Firstly in the autumn of 2012 the company was fined by the Security and Exchange Commission (SEC) for lying about the true amount of oil that gushed into the Gulf of Mexico after the explosion of the Deepwater Horizon rig. BP had to pay a record sum of more than $500m to its investors and shareholders for that, but what was worse is that the company broke the trust of its principal stakeholders. An interesting thing that should be pointed out is the fact that the news of BP being fined by SEC did almost not appear in the articles of that period. The second event that was the breaking point in BP’s strategy was when the company signed a settlement with the Department of Justice and opened itself to uncontrollable compensation claims and settlements. Key words that appeared the most in the articles from the Shareholder Cluster were: ‘’settlement’’, ‘’trial/ court-case/ lawsuit’’, ‘’compensation costs/ payments’’, ‘’criminal penalties’’ and ‘’low shares’’. The third sluster- Strategic Shift Cluster, was reviewing articles from the period between February 2013 and August 2013 when BP changed its strategy from defence to attack and went to court. This cluster was, like the other two, separated in three sub-periods – February-March, April-June and July-August and was the one characterised with the biggest score of negative coverage. As it is shown in the graph, the frequency of negative key words was high in the first sub-period scoring (-54). This is the time when the first phase of BP trial was due. During the second sub-period of the Strategic Shift Cluster the frequency of negative key words reduced to (-37). This could be explained with the fact that BP seemed to be in control of the situation by that time and was defending its position firmly. However, during the third sub-period an event that had a very negative effect over BP and the direction of the trial happened. The investors and shareholders decided to sue the company as a group in relation to the accusation of lying about the true amount of oil spilled into the ocean for which BP was fined by SEC in 2012. As a result of that the frequency of negative key words increased significantly in July and mostly in August 2013 scoring (-97). The key words associated with the Strategic Shift Cluster were: ‘’settlement’’, ‘’absurd/ fraudulent/ fictitious/ false claims’’, ‘’criminal charges/ penalties’’, ‘’trial’’, ‘’compensation payments’’ and ‘’contracts ban’’. The content analysis provided a solid basis of quantitative information which applied well to the findings made out in the literature review as well as in the secondary research. However, a qualitative method was needed as well in order to consolidate the arguments the research aimed to prove. My next post will reveal the results from my second primary research method- interviews. 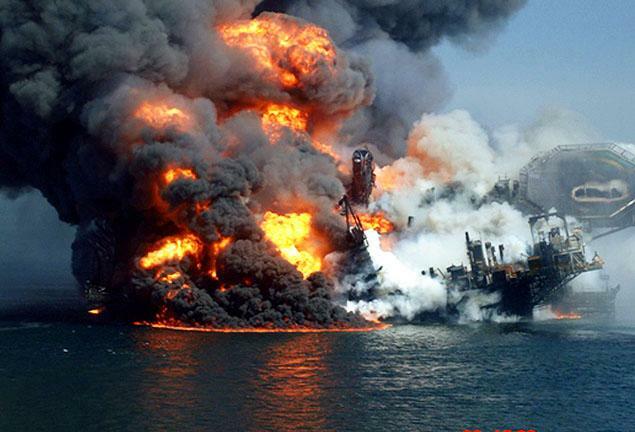 On April 20, 2010, the Deepwater Horizon drilling rig, which was owned by the Swiss company Transocean and was under contract by BP, exploded in the Gulf of Mexico. As a result 11 men, working on the rig lost their lives- 9 of whom were Transocean employees and two were employed by BP. Together with Halliburton (the cement provider), these three companies, mostly BP, were associated the most with the incident and were perceived as the main culprits. After the incident on the Deepwater Horizon platform, BP had three main communication aims: (1) to explain how it was trying to stop the leak of oil in the ocean; (2) to inform stakeholders about its intentions to compensate the victims of the incident; and (3) to keep stakeholders content, thereby avoiding court. For the first one, BP explained it was using a variety of techniques to stop the spill, none of them successful but the last one- relief wells were drilled, which resulted in stopping the leak in July 2010, two months after the blowout. However, as a result of the prolonged oil spill and the blowout, many businesses and individuals were affected. That is why the company set up a $20bn victim compensation fund to show its concern and willingness to pay all legitimate claims. Moreover, BP provided grants for promoting the tourism in the affected states of Louisiana, Mississippi, Florida and Alabama and committed $500m to a 10-year independent research on the consequences from the spill over the environment. In order to avoid going to court, the organisation took further steps, such as offering coastal residents cash payments in return for giving up their rights to sue the company at a later stage. If the strategy had been successful, then one might have seen some recovery in the image of BP in the eyes of its stakeholders. However, it is hard to call BP’s initial attempt at image repair successful. BP’s initial crisis communication campaign was trying to satisfy one stakeholder group- the victims- at the expense of another stakeholder group- the investors and shareholders. An interesting fact is that even though BP is a British company, the biggest percentage of its shares is owned by American shareholders. 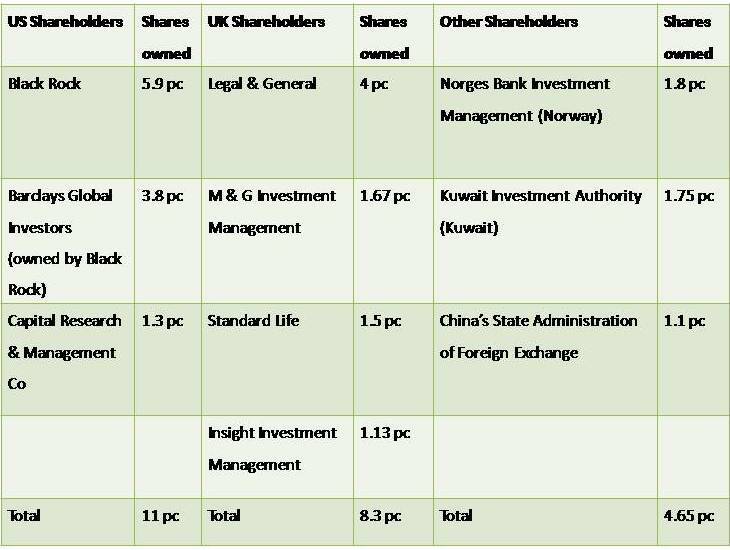 BP’s ten biggest shareholders own together 23.95% of the shares, 11% of which belong to US shareholders. That is why the American market is so important for the company and it put so much effort to restore its reputation and regain its stakeholders’ trust there. Moreover, five months after the accident on the drilling platform, BP replaced the British chief executive Tony Hayward with the American, Robert Dudley. A year after the incident in the Mexican Gulf, BP recovered a lot and escaped bankruptcy; however, the company’s share price was too low and still too far from recovery. BP had hit the bottom on June 25, 2010 with $27.02 a share but in a year’s time – in 2011 – had risen to $45.91 a share. However, this was still too low, compared to the share price on the night of the incident – $60.48 (25% above). What made things worse for shareholders was BP’s decision to sell $30 billion in assets in order to be able to pay the cleanup and victim’s compensation instalments. While selling down non-core assets meant that the company could meet its short term obligations, the shareholders would see this as damaging its longer term growth prospects. As opposed to BP, the other companies involved in the Deepwater Horizon accident have recovered much more. Transocean, the owner of the drilling rig, which is the other most widely associated organisation with the crisis in the Mexican Gulf, fell to $75 a share in 2011, from $90 a share the year before. On the other hand Halliburton’s (the cement provider) shares rose from $30 in 2010 to $46 in 2011. Cameron International’s (the manufacturer of the blow-out preventer) shares also increased from $45 to $54 as well as the share price of Anadarko Petroleum, having 25% stake in the Macondo project, rose by $5 from $75 in 2010 to $80 in 2011. The results above show that when a big crisis of global significance occurs, the one to blame and collect most of the negative reputation is the one that is most recognisable and the one with the “deepest pockets”. Even though many other companies were involved in the incident, the only one that was almost bankrupted was BP. Because BP is a globally known company, the focus was on it as well as the public and US Government pressure. The next blog post in this section, will be discussing the mistakes BP made as part of its crisis communication strategy. Don’t miss it!